Ratha Yatra, the Festival of Chariots of Lord Jagannatha is celebrated every year at Puri, the temple town in Orissa, on the east coast of India. The presiding deities of the main temple, Sri Mandira, Lord Jagannatha, Lord Balabhadra and Goddess Subhadra, with the celestial wheel Sudarshana are taken out from the temple precincts in an elaborate ritual procession to their respective chariots. The huge, colourfully decorated chariots, are drawn by hundreds and thousands of devotees on the bada danda, the grand avenue to the Gundicha temple, some two miles away to the North. After a stay for seven days, the deities return to their abode in Srimandira. 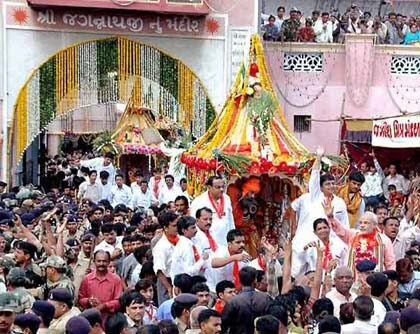 The Puri Rath Yatra and the Rath Yatra of Ahmedabad, Gujarat take place on the same day. In grandeur and popularity, the Rath Yatra of Ahmedabad stands next to the Puri festival. The Ahmedabad Rath Yatra has been taking place for more than 130 years. Akin to the Puri celebrations, the three chariots with the idols of Lord Jagannath (Krishna), Balarama (Balabhadra) and Subhadra are pulled by the devotees through the city. The procession starts from the Jagannath temple in Jamalpur locality in Ahmedabad city and passes through a 14 kilometer route. Nowadays, there are not just the thousands of people who participate in the Ahmedabad event, there are also communication satellites which the police use under the global positioning system to chart the course of the chariots on a map on the computer screen to monitor them from a control room. This is because Ahmedabad Rath Yatra has a bloody record. The last violent Rath Yatra which the city saw was in 1992, when the city suddenly became surcharged with communal riots. A highlight of the Ahmedabad Rath Yatra is the procession of caparisoned elephants. Decorated elephants participate in almost all the important rituals associated with the festival. Another important feature is the participation of Akhada Sadhus and Mahants and the numerous floats with different themes. The day-long procession ends with the chariots returning to the Jamalpur Jagannath Temple. These days, the police use under the global positioning system to chart the course of the chariots on a map on the computer screen to monitor them from a control room. This is done to ensure the safety of the devotees.